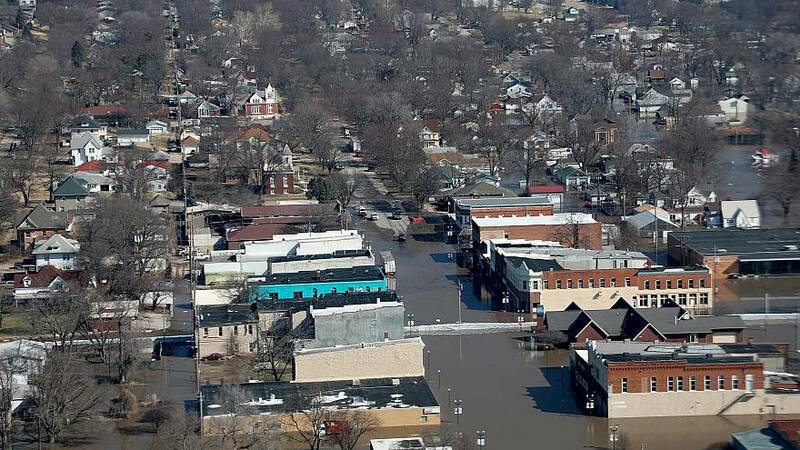 La Crosse, Wisconsin — In two states that flipped from Democratic to Republican in the 2016 presidential race, the devastating floods are focusing voter's attention on climate change — and the both parties' response to it. "My big concern is the environment," said Amy Bouska, a retired actuary, at a town hall event for freshman Democrat Rep. Amy Finkenauer from eastern Iowa. "People know that the Canadians are clearing land to plant corn." With mid-western states grapple with historic flooding that is devastating communities and threatening crop rotations and livestock, some voters are demanding action on what they see as the cause: climate change and more extreme weather patterns. At another town hall, across the Mississippi river, in La Crosse, Wisconsin, voters told their local congressman, Democrat Rep. Ron Kind, that the effect of climate change on the farming community was worse than many in Washington might think. They also implored Kind to support the "Green New Deal" pushed by Rep. Alexandria Ocasio-Cortez, D-N.Y.
"The roll out of the Green New Deal didn't go very well," he said. "But the aspirational goal of recognizing the danger of climate change is something that we need to recognize and work towards." That answer left some of his constituents frustrated and it may contribute to a primary challenge for the 22-year congressional veteran in 2020. Later, along the swollen banks of the Mississippi River, with sheets of ice gliding downstream to some of the areas hardest hit by the flooding, Bernie Sanders' supporters protested outside a birthday party for Kind, demanding "Medicare for All" and more robust action to counter climate change. Amy Hartung, a political activist and Sanders supporter, said that she wasn't happy with Kind not committing to the Green New Deal. Neumann knows that he faces an uphill battle. Wisconsin's 3rd Congressional district voted for Trump in 2016 by two percentage points after going for then-President Barack Obama in 2012. But Kind's deep ties to the community and centrist positions allowed him to withstand a surge of Trump support, winning in 2016 and cruising to reelection in 2018.